Should You Hold Onto Wandy Rodriguez, Rich Harden, and Ricky Nolasco? Time to take a look at some more “toxic assets,” or players who may have been highly drafted but have done little so far this season to warrant fantasy roster spots, besides a recognition of past accomplishments and potential upside. Deciding when to cut bait on these underperforming players often requires a gut check. But with so much potential help on the waiver wire in standard leagues, teams can only afford so much latitude in giving players time to get their act together. Let’s examine some pitchers who are candidates for dumping. Wandy Rodriguez has been a tremendous disappointment this season. He entered the year as a borderline fantasy ace, with solid peripheral skills. In 2009, he posted 14 wins, a 3.02 ERA, and a 1.24 WHIP. He backed those numbers up with a strong strikeout rate (193 in 205 IP), nice command (more than 3 Ks for every BB), and a respectable ground ball rate (45%). Right now, he’s showing just 3 wins, a 5.60 ERA, and a 1.67 WHIP. He’s gone from a potential #1 on a fantasy team to just the third-based SP on the awful Houston Astros, behind Roy Oswalt and Brett Myers (perhaps behind Felipe Paulino too). What’s especially concerning about Rodriguez is the big dip in his strikeout rate: It’s gone from 8.45 K/9 IP to 6.22 this season. Most recently, he’s shown modest improvement in striking out batters, but unfortunately, it’s gone hand-in-hand with rising numbers of walks and home runs allowed. His xFIP is a pedestrian 4.48 at the moment – much better than his ERA, but still nowhere near his former ace status. Rodriguez has never been a hard thrower, averaging just over 89 MPH on his fastball throughout his career. Velocity readings show not much change this year, and other than an increased use of his changeup, there doesn’t seem to be that much difference in his pitch selection. Instead, his buckling curveball has become a lot less effective this year, as word spreads that he hasn’t been able to locate it well. Perhaps this is a minor adjustment, but if it was so easy, he probably would have made it already. Rodriguez’s next two games are both at home, against Texas and San Francisco. He’s traditionally played much better at home. He’s probably a hold for at least another couple of games, but if he can’t turn in a solid game against the weak-hitting Giants at home, he deserves to be cut. Rich Harden recently went on the injured list, which in some ways may have been good news for some owners with DL roster allowances. Before succumbing to the inevitable injury, Harden was terrible, posting just 3 wins, a 5.68 ERA, and a 1.68 WHIP. Harden wasn’t great in 2009 with an ERA over 4 and a WHIP at 1.34. But he performed better than his superficial stats may have suggested, striking out nearly 11 batters per 9 innings and posting a solid xFIP of 3.70. This year, Harden’s strikeouts are down to 8.17 Ks per 9, which would be a strong enough rate if not for the fact that his command has been truly lousy. He’s walking nearly 6 batters per 9 IP, the worst rate in the major leagues. Harden is also allowing more HRs (nearly 2 per 9 IP) and it doesn’t take a rocket scientist to figure out that putting men on base by walk and then allowing HRs is not a formula for success. If he wasn’t on the DL, we’d recommend he be dropped. After all, the injury-prone player misses a lot of time anyway and plays in one of the friendliest hitters’ environments. If fantasy teams have room to stash him on DL in hopes of a turnaround after getting healthy, that’s fine. However, he shouldn’t be given much rope even when he does return. Ricky Nolasco hasn’t won many fans this season with 5 wins, a 5.05 ERA, and a 1.38 WHIP. He’s also no stranger to bedeviling fantasy owners. Last season, his ERA was in the 9’s in May before he got demoted to the minors. Nolasco eventually brought his ERA down to 5.05 by season’s end; his xFIP was an outstanding 3.28. But last season, Nolasco was striking out more than a batter per inning and flashing elite command. In 2010, his strikeout rate has dipped down to 6.6 K/9 and his flyball and HR rates have both climbed. According to an analysis by Mike Axisa at Fangraphs, the problem seems to stem from lost movement on his pitches, which has made them easier for batters to connect. Nolasco has a neutral upcoming schedule, with battles against the Rangers, Orioles, and Mets. It’s also important to note that Nolasco could be a trade candidate for the Marlins, which may take him out of the stadium that ranks fourth-best for hitters this season. For now, Nolasco shouldn’t be dumped, but his leash is definitely growing shorter. Wandy Rodriguez joined the ranks of baseball’s elite starting pitchers in 2009. The Houston Astros left-hander went 14-12 with a sparkling 3.02 ERA in 33 starts in 2009. He also struck out 193 batters while topping 200 innings (205.2) for the first time. Those are impressive numbers for any pitcher, but there is reason to believe Rodriguez can duplicate those numbers in 2010, and maybe improve them. There is a lot to like about Rodriguez’s game. His career strikeouts per nine innings (K/9) rate is 7.5, but he has posted back-to-back seasons over 8.4. In each of the past two seasons, Rodriguez has lowered his walks per nine (BB/9) and stabilized his home run rate to less than one home run per nine innings (HR/9) – no small feat in the cozy confines of Minute Maid Park. In addition to his swing-and-miss stuff, Rodriguez gets his fair share of ground balls. He owns a career ground ball rate (GB%) of 43.5%. In 2009, he elevated that number slightly to 44.9%. Rodriguez had a rather normal batting average on balls in play (BABIP) of .306 last year, despite some below-average fielding behind him. Looking at ultimate zone rating (UZR), Miguel Tejada, the Astros’ shortstop last season, had the lowest UZR (-13.9) of any National League shortstop. Second basemen Kaz Matsui was rated a bit higher, but his UZR (-1.7) was still in the red at season’s end. With Tejada now at third base for the Baltimore Orioles, Houston will turn to rookie Tommy Manzella at shortstop. What? Who? Good questions. Manzella is a slick-fielding shortstop who has toiled around the upper levels of the Astros minor leagues for the past few seasons. Recently, ESPN.com writer Tim Kurkjian noted that Manzella’s defense has been major league-ready for years, but only now is the 26-year-old getting his shot. Over the past few seasons in Triple-A, he has rated above average defensively by totalzone, a metric similar to UZR. With Manzella projected to be the team’s every-day shortstop, Rodriguez could see his BABIP creep closer toward .300 and maybe even lower. A lower BABIP could knock Rodriguez’s already stellar 3.02 ERA down below the 3.00 level. Despite the solid control rates (K/9, BB/9) and the favorable batted ball data (GB% and HR/9) some might say Rodriguez is a one-year wonder; Bloomberg Sports disagrees. 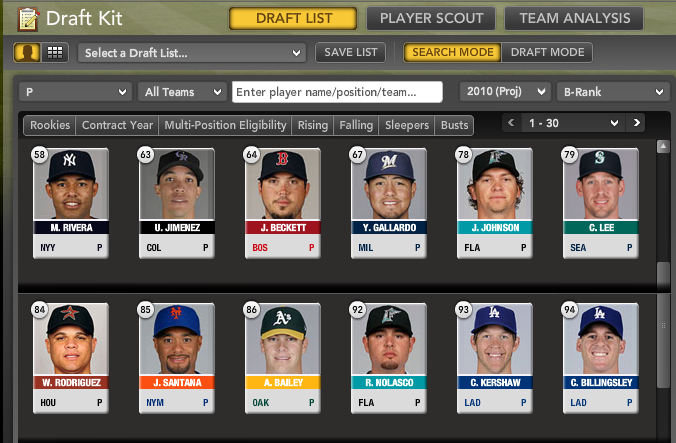 Looking at B-Rank, Rodriguez is slotted one spot ahead of fellow lefty, and traditional fantasy baseball stud, Johan Santana. Though Santana is behind in B-Rank, his average draft position (ADP) of 37.1 is nearly 74 spots ahead of Rodriguez (110.6). 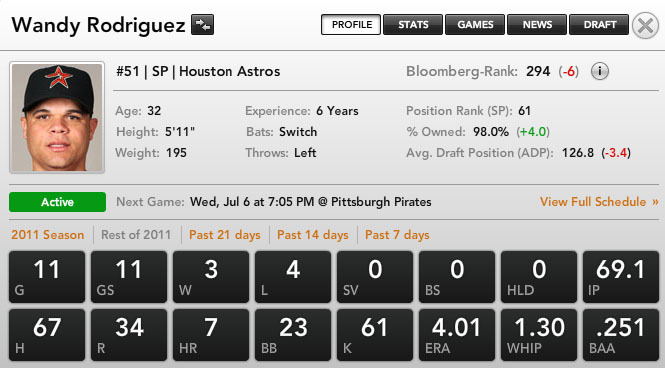 Bloomberg Sports projects Rodriguez to go 13-10 with a 3.11 ERA and 183 strikeouts in 197 innings this season. The same system projects Santana at 14-10 with a 3.31 ERA and 172 strikeouts in 193 innings. While Rodriguez should benefit with improved defense from Manzella, Santana is likely to start the season without two of his best defenders behind him: Carlos Beltran and Jose Reyes. Given the projections, the noted defensive changes, and the 2009 injury to Santana, Rodriguez is not only the better value, but could be the better pitcher outright in 2010. Why waste a third-round pick on Santana when you could get similar, if not better, production from Rodriguez later? I don’t know about you, but I’m not a fan of paying more for less. 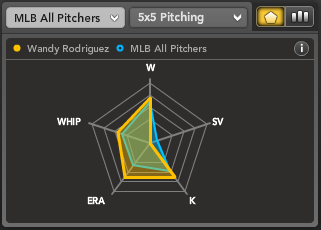 information on Wandy Rodriguez and other top-flight starting pitchers, check out Bloomberg Sports’ fantasy kit.